Whatever/whoever else is important to you. 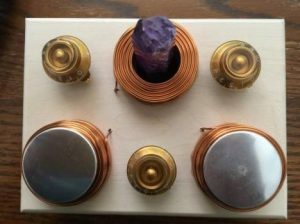 Crystals and Dials designed in opposite triangles for “As Above, So Below” to better transmit the nonphysical into the physical. Flow direction of the Witness and Treatment Coil is “right to left” emphasizing “right brain/nonphysical to left brain/physical”. Witness is in Location #3 so that the Perfection Frequency of the Number 3 adds to transmitted frequencies. Crystals and coils designed in a Diamond configuration – 4 Coils representing physical reality and the diamond configuration representing the crown chakra. Amethyst Crystals are also representative of the crown chakra and a great aid for violet. Flow direction of Witness and Treatment is “right to left” emphasizing “right brain/nonphysical to left brain/physical”. The 4 coil diamond/crown chakra is also the perfect way to symbolize the entry of non-physical energy through your crown. Crystals and Dials designed in opposite triangles for “As Above, So Below” to better transmit the nonphysical into the physical. Flow direction of the Witness and Treatment Coil is “right to left” emphasizing “right brain/nonphysical to left brain/physical”. 4 Amethyst Crystals symbolize the 4 proteins of DNA. Witness is in Location #5 so that the Healing Frequency of the Number 5 adds to transmitted frequencies. Made with the same exacting detail and housed in exotic Purple Heart Wood. Double Terminated Crystals – Darker Violet Amethyst, a higher grade amethyst. AA-AAA quality to provide a Clean, Clear & True Frequency Broadcast to unite the frequency of the Balance & Witness! AA-AAA quality, used for piezoelectric power generation. Removable crystals can be cleaned of prior frequency resonances, unlike electronic components used in many boxes, providing a Clean & Pure power source. Quartz Crystals may be double or single terminated depending on availability. 500k Ohm or – 10% tolerance levels – High Quality – Audio Taper to ensure a smooth progress from 0 to 10. 500K, or – 10% tolerance levels minimal taper difference from one potentiometer to the other. 500k ohm Potentiometers hold more frequency, a definite PLUS for YOU.minimal to no error rate. Copper washers may be included with your box. These washers are to be stacked on top of the coils that hold the Quartz Crystal in the event that your silver disc does not sit properly on the coil. All crystals are different and can pose challenges to properly fitting in the space provided. The washers are 99.99% pure copper, jewelry grade. 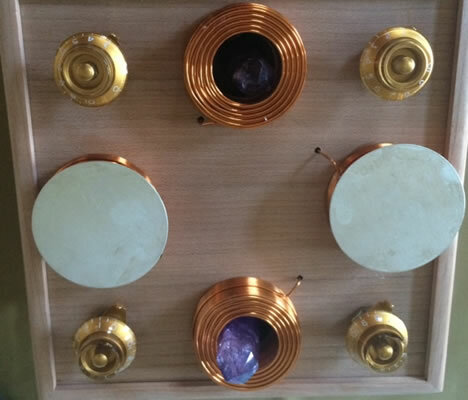 4-Dial box – Box: 6-1/8” x 2”x4-5/8” – with Coils & Crystals, add 2” to height. 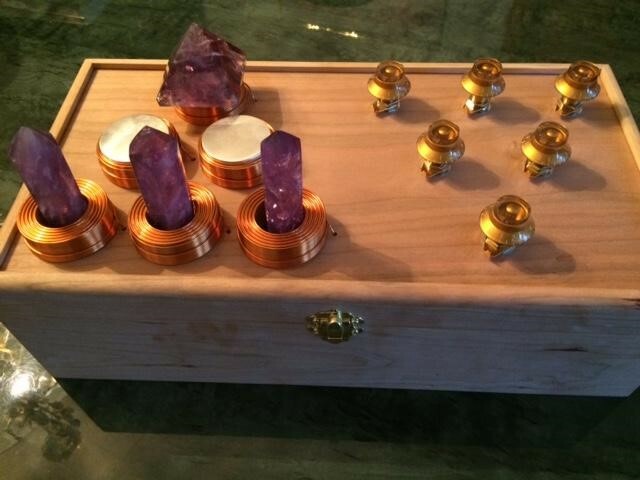 6-Dial box – Box: 13 3/4” x 7 1/4 x 4” – with Coils & Crystals, add 2” to height. Do Not Leave the Lid Open or the Box Unattended. Each box is individually hand crafted and due to the nature of natural crystals and quality sourcing issues, your box may appear different to what is pictured here. Rest Assured that our Standards of Quality & Function will be the Same. I attended the August Radionics workshop—it was fun and very informative! Within weeks of configuring my box; I noticed a higher level of mental clarity as if an unseen fog had cleared and an invisible door opened. This clarity continues, I consistently get new insights—some pretty and some not so pretty! Radionics is an amazing supplement to what you want to accomplish—think of it as super-food for your Mind! I attended the Radionics Workshop as well. I now have 2 boxes and oh wow, they are awesome! I can feel them working, have had success with certain physical challenges, I always set one up for protection and support while I travel. I tried one on a friend, with her knowledge, and she told me she felt nothing, but the words she chose to use told me it had assisted her a lot! I have the six dial radionics box, it has many uses. In my experience it’s a unique item, and one of my most treasured tools! I used it for healing and before I knew it I gotten great ideas for tincture recipes or tincture mixing. Never before has that happened, after that I used it off and on for boosting finances and it worked!! Like all things this item is a boost to what’s already in you. 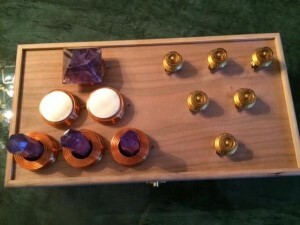 3 Dial Travel Radionics Box - $800. 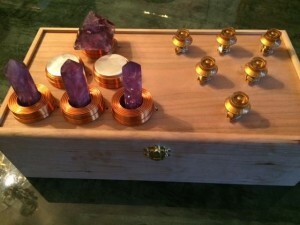 4 Dial Personal Radionics Box - $944. 6 Dial Professional Radionics Box - $1700. 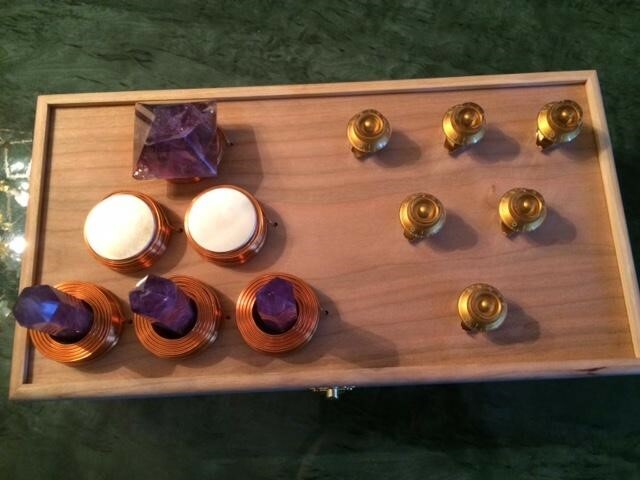 8 Dial Deluxe Purpleheart Wood Radionics Box - $2960. Shipping, Handling and Insurance to be determined!